1. It never starts before 10am: yes, I am actively savoring the time I have left to enjoy sleeping in. I know in a few short years my Saturday and Sunday mornings will be filled with screaming babies (if all goes well), but for now I am enjoying the quietness, and general lack of responsibility that comes with the weekend. If this makes me a jerk, fine. 2. Day drinking: I cannot fully describe why day drinking is the best, but I think it has to do with the weather. Stick with me here for a moment… think about it, when you enjoy a alcoholic beverage during the day, you are almost always outside, soaking up the sun. Nobody looks forward to drinking mimosas and Bloody Mary’s outside in the cold, or even worse, indoors. People love day drinking because it means the weather is amazing. 3. Oh yeah, and the food: I can almost always find something paleoish on a brunch menu that I don’t have to ask for modifications to, and it is nearly always delicious. It is really, really hard to screw up brunch food. 1. Prep the vegetables by dicing the onion and bell pepper, and finely chopping the garlic and jalapeño. Peel the sweet potatoes and chop into 1/2 inch dice. 3. Add the onion, bell pepper, garlic and jalapeño to the pan and cook until the onions begin to soften (about 3 minutes). Add the sweet potatoes and some salt and pepper and cook until tender, but not mushy. Stir frequently, and add chicken stock periodically during the cooking to de-glaze the pan and keep the potatoes from sticking. Once tender, stir in the reserved chorizo and cilantro and heat for another minute or two until the chorizo is warm. 4. Heat the remaining 1 tbs of coconut oil in a small skillet over medium-high heat. Once heated, crack the eggs in the pan and cook to your desired doneness (I did over-easy here). If you aren’t great at frying eggs, check out this video for some tips. Note: If you are comfortable with multi-tasking, you can do step #4 while the potatoes are cooking, otherwise wait until they are done. 5. Spoon a healthy portion of the hash onto a plate, top with a fried egg and sprinkle with salt and pepper to taste. Enjoy!! 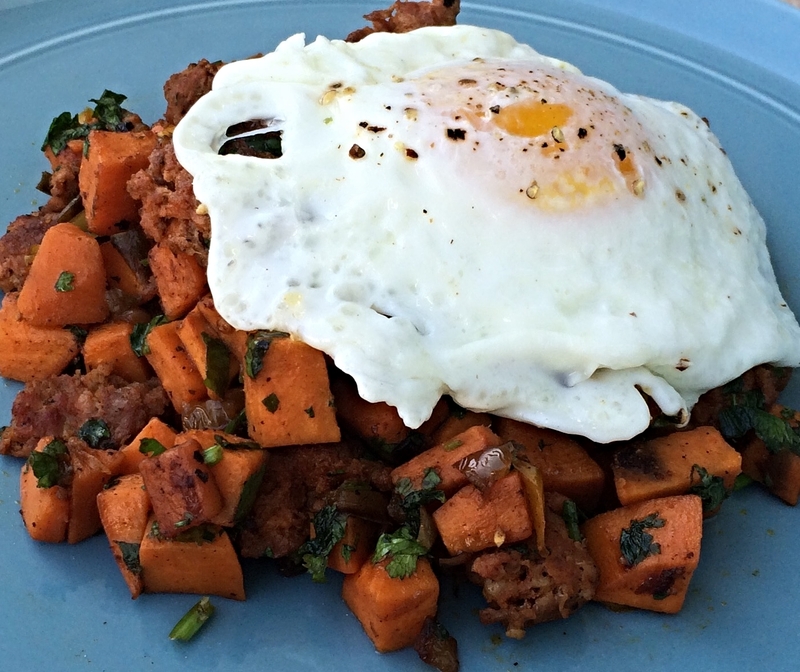 Tags: 30 - 45 minutes, Eggs, Gluten Free, Paleo, Pork, Primal, Under $5 / serving, Whole 30. Bookmark the permalink.